Anna Strickland will be present for conversation. 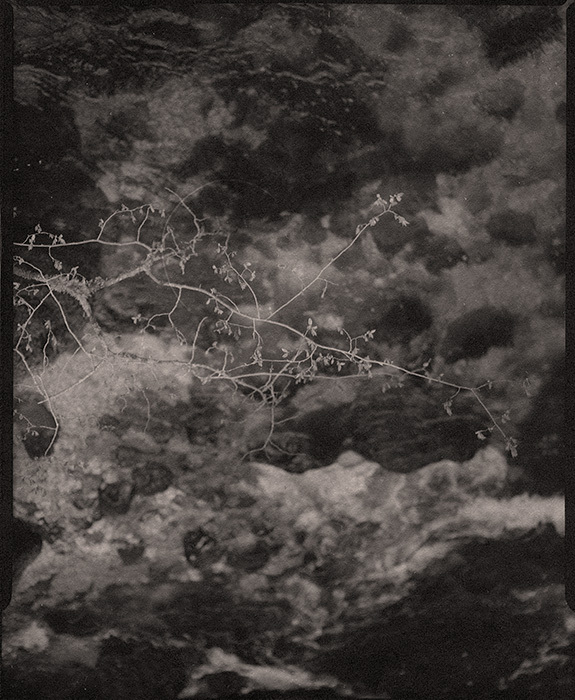 Anna Strickland’s lecture, demo, and video at Art Intersection: Friday, October 7, 6:30 pm. I have been working on an extended installation since 2004 called “Mind the Gap” which has to do with humankind’s relationship with the natural world. The “Given Installation” was generated from the same root as “Mind the Gap” but was from the beginning inspired by a more personal experience. With Given I focused more on the spiritual and found the participatory aspect of the work (inviting friends to offer in their hands a favorite or treasured natural object) celebratory. “From the Faraway Nearby” the latest iteration is my most personal work to date from the same root. The title comes from a book by Rebecca Solnit (one of my favorite authors). Deep into the book she revealed that the title came from reading Georgia O’Keefe letters. 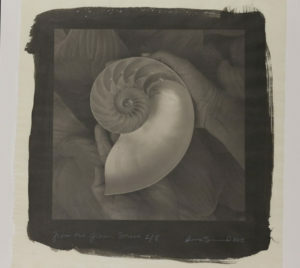 When Georgia O’Keefe first moved to New Mexico from New York she signed her letters “from the faraway nearby”. The phrase resonated for me in thinking about how many people take the natural world for granted ­– how it is right here, nearby but in the human mind and world mostly distanced and faraway. In the Jura Mountains, the Valley of Consolation cuts its way through a landscape of stones and water, trees and light. Thanks to a chance encounter and lead by a strong desire to run away, Sabine Guédamour discovered this place in 2010, heavily packed with her photographic equipment and tripod. Hiking is the only way to get there and the scenery offers a great reward after the effort: a magical place, away from the world. After shooting with a large view camera, she chose to print her images with palladium, a historical photographic process where the alchemy of photography operates with light and metal salts, like when it was invented, more than 150 years ago. The palladium, an extremely perennial process, provides prints identical in size to the negative, with endless and deep shades of grey, profoundly embedded within the paper. After the shooting, amidst nature and silence, comes long hours of printing in the darkroom, improvised in a bathroom in the Paris suburbs. Despite the important geographical gap and the radical change of atmosphere, a continuity in the emotion and precision remains. The photographs of “Consolation” reveal a certain appeasement in a landscape where the geological time mingles with the seasons. We can no longer hear the waterfalls or birdsongs, but we can see the water eroding the rock and buds sprouting. Sabine Guédamour transforms this lost paradise into a monochrome contemplation. Photographing to reach a resilience, to protect a memory against extinction.